Today I wanted to tell you about my favourite hand cream - Soap and Glory's Hand Food - It has the lovely distinctive smell of Soap and Glory products that I am literally in love with and comes in the also very distinctive Pink Soap and Glory packaging, I have so many pots and bottles of this, it's ridiculous, I keep one in my handbag, one in my laptop bag, one on my work desk, several at home and several at my parents (probably because I'm such an air head and leave things everywhere). Not only does this hand cream smell lovely, but probably one of the most important things is that it leaves hands lovely and moisturised, but without that greasy feeling a lot of hand creams leave, it's one of my pet hates when you apply hand cream and then can't do anything for 20 minutes while you wait for it to soak in, this absorbs super quick so you can carry on as normal as soon as you've put it on. When I first spotted this, well over a year ago, the first thing that drew me to it was that it mentioned it had Marshmallow in it, which immediately sold me on it but it also has Shea Butter and Macademia Oil in it, which explains it's lovely moisturising properties. I'm not going to lie to you, I haven't always been faithful to this lovely hand cream, Unfortunately, I'm quite fickle and have a tendancy to move onto the next shiny thing that comes along, but this is definitely the hand cream I always have gone back to. This comes in 2 sizes, a handy travel size that is 50ml (£2.35) and a lovely big tube that is 125ml (£5), you can pick both of these up in Boots or grab them online here and here! I find that the little travel size tube lasts me around a month and half so the bigger tube probably has around 3-4 months worth of use! Have you guys tried Hand Food? What's your favourite Hand Cream? 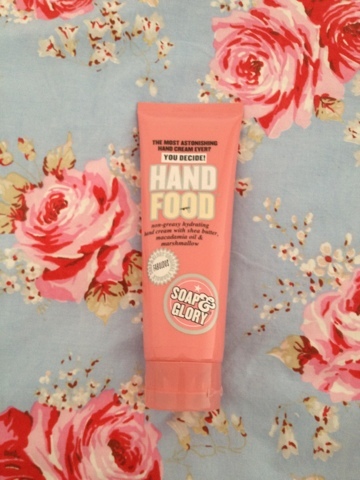 2 comments on "Soap and Glory Hand Food Hand Cream"
This stuff is amazing :) One of the best hand creams out there!